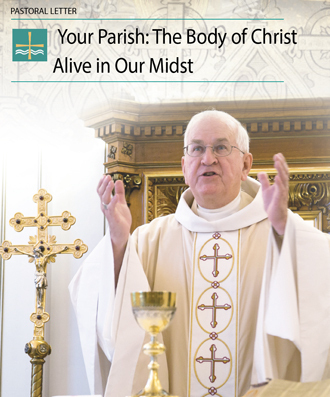 In a follow-up to his first pastoral letter, Archbishop Joseph E. Kurtz calls on the Holy Spirit to help parishes in the Archdiocese of Louisville to be “healthy, holy and vibrant” and applauds the efforts of parishes in this endeavor. He promulgated “The Soul of the Parish: Being Led by the Holy Spirit Alive in our Midst” on Aug. 15, the feast of the Assumption and the 11th anniversary of his installation as Archbishop of Louisville. From the beginning of his episcopacy, the archbishop has prioritized parishes. He spent weekend after weekend visiting parishes in his earliest years. Still today his schedule reflects a rigorous attention to parish visits. His first pastoral letter, published by The Record in January of 2017, offered the archdiocese’s 110 parishes a process they could follow to discern — through prayer and study — what God is calling them to do. pages A8 to A12 of this week’s paper. “I hope the process will continue to make our parishes and our archdiocese healthier and holier,” he said during an interview about the process and his latest pastoral letter late last week. In the letter, which is divided into four parts, Archbishop Kurtz takes note of the various plans parishes have developed as a result of the process and offers encouragement as they begin to take action. “These plans will require careful collaboration so that diocesan ministries might be of assistance, and parish leaders will emerge as we seek to support families, seek new and vibrant ways to announce and teach the Good News of Jesus Christ, and serve others in Christ’s name,” he writes. He notes in particular, “the keen concern about how we pass on the faith to people at all stages of life and the special care for those who have grown inactive, even some members of your families who deserve to be encouraged to come closer to Christ. “I applaud efforts to reach out beyond our parishes to our communities and to specific populations in need, such as the homeless, seniors, those with addictions, and hurting families,” he writes. As he encourages parishes to continue in discernment and develop their plans, he also cautions them about a handful of challenges. First, he warns parishes against reducing “this graced time of discernment simply into a task list to complete,” he writes. “Equally mistaken would be to reject changes that such discernment might bring to the parish,” he says. – To announce and incorporate results of the process into “already existing leadership structures,” such as the parish council and other major committees. – Be sure that all parishioners see the results of the process. – Reach out for assistance by calling the archbishop’s office and working with archdiocesan agencies. Before he concludes by invoking the Holy Spirit, he invites parishioners in the Archdiocese of Louisville to attend a day of prayer in gratitude for the process of discernment on the first Mass of the new church year, Dec. 1. On that day, he will celebrate the Saturday evening Mass at the Cathedral of the Assumption. A special prayer of gratitude, meant to accompany the letter, appears on page A12. Archbishop Kurtz said in the interview last week that he gives thanks for the process of discernment, in particular, in the midst of the clergy sexual abuse crisis. “The pain and the confusion and the anger people are feeling right now with the abuse crisis are not separate from discernment — that’s the church, too,” he said. “If we want to repair our church, we need discernment. The archbishop has announced that on Oct. 5 he will observe a day of prayer and fasting and he invites Catholics to join him. He also plans to hold a public prayer service that evening at Holy Family Church at 6 p.m.